Samabe Bali Suites & Villas announces Ketut Kusumajaya (Jay-Z) as the new Butler Manager on April 1, 2016. "This team is my second family and I am ecstatic to welcome the challenge" Jay-Z uttered that the team is his motivation to show fortitude in facing the new position. Jay Z is promoted from the Assistant of Butler Manager after his 3-year tenure at the luxury all inclusive resort in Bali. He has proven himself as a responsible and loyal man to his work as well as an inspiration for the team. Prior to his duty at Samabe, Jay-z has worked in several international chain hotels in Dubai and Bali since 2001 such as Kempinski Hotel Dubai and Jimbaran Puri Bali Resort and Orient Express Hotel. His experience of working in cruise has also shaped him to become a man with strong will. The new position requires him to train the butlers to deliver Samabe memorable experiences as well as updating the knowledge of the team twice a month. In addition, he makes sure Samabe will not leave a bad taste to the customers, so that they will return as a family in the future chance. "I trust my guts that Jay-Z is the perfect person for this position. 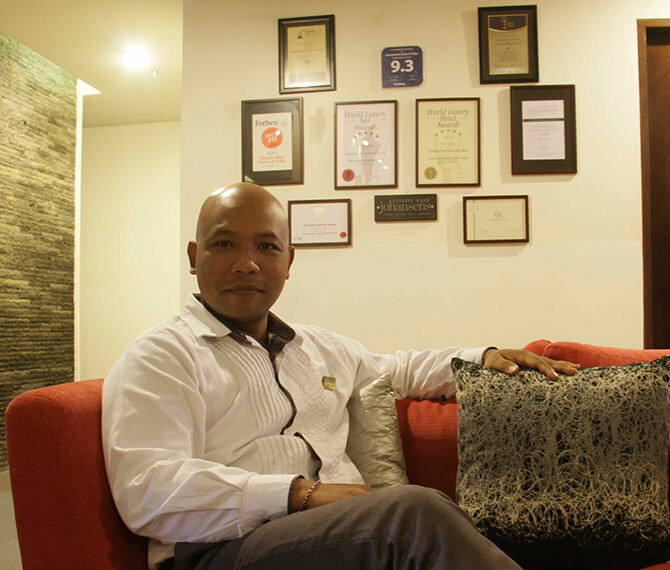 He has shown his dedication to develop himself and his team", said Danny Sinaga as the Resident Manager of Samabe Bali Suites & Villas. Worked with Jay Z for more than a year, Danny believes Jay-Z will take the team to a positive growth.